If you are an e-commerce store owner, it may be difficult for your customers to find their wanted products that they are looking for before getting overwhelmed by hundreds or thousands of featured products in your store. Hence, how can customers find the product quickly? That is the reason why it is essential to have an all-around module that helps you solve all the difficulties customers are facing. Today we will introduce a great tool for smart shop owners. It is Mageplaza Layered Navigation for Magento 2. This extension allows customers to find the products they desire and provide great shopping experiences. Here is precisely the magic key to unlock your shop door. According to some studies, Mageplaza Layered Navigation for Magento 2 has brought a hugely valuable asset to e-commerce stores. It enhances the user’s filtering experience, reduces the time spent on shopping on your website, and notably increases conversion rate up to 25%. The figures below are definite proof that using Layered Navigation by Mageplaza will deliver wow shopping experience to shoppers, and also bring you more revenues from this. Follow us to explore the great features of this module as well as to understand the reasons why you should choose Mageplaza Layered Navigation Magento 2. A great feature that Mageplaza is proud to introduce to you, named ‘Ajax loading’. Thanks to this feature, your customers will feel more comfortable shopping on your website. This feature allows customers not to reload the page while loading additional products on the site. ‘Ajax loading page’ feature will help customers save time by filtering the products they want, and from that, customers can search for products faster, so it’s more likely that they will purchase. Multi-filter is a necessary feature for every e-commerce store. With Mageplaza Layered Navigation, customers can select multiple options at the same time on an attribute. Thus, it saves time searching for products when filtering thousands of different products on the page. Indeed, this feature helps narrow down the number of products that customers search for and bring more satisfaction to the customers. Make sure that customers will return to your store for the next purchase. Pricing is a vital factor for customers in deciding whether or not to buy your product. Understanding this, Mageplaza Layered Navigation provides the ‘price slider’ feature. It allows your customers to customize their prices to fit their budget while filtering. Mageplaza offers a wide variety of sliders including Flat UI skin, Modern skin, HTML5 skin, Nice white skin, and Simple dark skin. You can choose the slider that suits your store’s style. In addition to the usual filtering methods, Mageplaza provides some other useful filters for customers named ‘Product state’ and’ Ratings’. With these great filtering methods, it will help customers quickly find the products that they love as well as increase your store’s business performance. ‘Shop By Brand’ feature is a must-have feature for every online store. Mageplaza releases this feature as a beautiful solution for customers. It allows customers to filter products based on the product brand that they are finding. Immediately, the number of products will narrow, and then, the customer’s job is to add that product to their shopping cart. Thanks to this feature, customers save more time during the shopping process. In addition to the outstanding features, Mageplaza Layered Navigation also offers many powerful features that will surely bring you unexpectedly fantastic performance in your business. SEO-Friendly URL: One of the critical search engine optimization tools that help rank your site on Google is ‘SEO-Friendly URL’. Understanding the importance of it, Mageplaza has integrated this fantastic feature into Layered Navigation. This feature helps you significantly improve your SEO performance for your website. Also, with simple and easy-to-remember URLs, visitors can easily remember and bookmark them to visit your site in their next shopping. Apply filter button: By enabling this button from the backend, customers will no longer take much time to look at the page again each time you select a filter. After the customer chooses all the filters for the product that they are looking for, at the bottom of the Layered Navigation section you need to click on the apply button This will save them considerable time when shopping at your store. Infinite scrolling: This feature dramatically improves the user experience. Customers no longer spend much time waiting for page loads, infinite scrolls will help visitors surf the web comfortably and bring pleasure to customers when looking for the product they want. Vertical & Horizontal Navigation: Understanding the difficulties of merchants when using too many modules for their online store, Mageplaza offers a user-friendly and flexible design. Store owners will have two options to display in their shop which are Vertical and Horizontal. Importantly, It is easy to use whether you are a beginner or an expert. Also, visitors to your website will also see a helpful and friendly interface. This feature can impress them in the blink of an eye. Quick Lookup options: Filtering products will be more accessible than ever if your store includes the ‘Quick Lookup options’ feature. Mageplaza Layered Navigation will help you solve this. Thanks to this feature, customers only enter the keywords they need to search the search box, and the results will show in seconds. If you enable the ‘Custom Products Pages’ feature, all of your items will be displayed on a single page. And of course, customers will not need to find the exact category page they want. Please go to Mageplaza > Layered Navigation > Configuration. You will see three sections to modify the module’s features according to your desire. First, General Configuration provides full features of the Layered Navigation module. By selecting ‘Yes or No’ to enable or disable it. Features in this section include Multi-filter, Scroll to the top after filtering, Quick lookup options, Display the out-of-stock option, Display product count, Expand by default, Show type, Add the apply filter button, Infinite scroll, Show navigation. Next, Additional Filter allows you to choose other filters such as Product State and Rating. By selecting yes or no to enable or disable these features. With each filter, you can configure the features included in those filters. Let’s turn on the features that you find it necessary for your online store. Finally, with the ‘Design Configuration’ section, you have the right to choose the slider that you see fit your store. Click on the drop-down in the ‘slider type’ field to choose slider types such as Flat UI skin, Modern skin, HTML5 skin, Nice white skin, and Simple dark skin. Here is the image after you use Mageplaza Layered Navigation. As you see, Mageplaza Layered Navigation has a straightforward design and beautiful interface. All features are in the sidebar, so when your customers to the website will quickly filter the product. There is no doubt about the convenience and usefulness of this module for your online store. Mageplaza Layered Navigation provides three packages: Standard, Professional, and Ultimate. 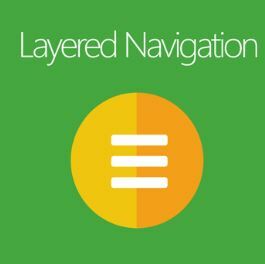 Layered Navigation is a powerful extension that comes with tons of useful features. If you an intelligent store owner, you must own this module for your online store. Not only does it help increase the revenues but also can improve the user experience dramatically. Don’t miss this module, Mageplaza Layered Navigation is released to be for you.